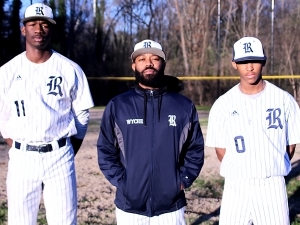 Redan’s Donye Evans (l-r), Coach Alexander Wyche and Ryan Pruitt helped the Raiders to a 2-0 record during Spring Break baseball action. In a limited schedule due to spring break, only 10 of 19 DeKalb County high school baseball entrants saw action last week. Only two of those teams managed to escape with undefeated records. Coach Alexander Wyche’s Redan Raiders led the way in that tandem, posting a perfect 2-0 mark. Redan rolled past Sandy Creek (13-3) April 2 and Lakeside (11-1) April 4 in the combined margin of 24-4 in improving to 17-6 overall on the season. Redan pounded out 11 hits in a 14-3 decision over Sandy Creek April 2. Senior Yereny Batista (2-3; 3 RBI; 1 RS; 1 HR) and junior Donye Evans (2-2; 2 RS; 1 SB) led the offensive charge. Evans also picked up the pitching decision in the contest, striking out eight and allowing only one hit and one walk over four innings. The Raiders also received double digs hits from senior Kameron Guidry (2-2; 2 RS; 2 RBI; 1 HR; 1 2B), junior Brandon Lamback (2-3; 2 RS) and senior Christian Webb (2-3; 4 RBI) in an 11-1 triumph over Lakeside April. Senior Kevin Kilpatrick earned the mound triumph, striking out six and allowing six hits and one earned run over five innings. Coach Matt Masce’s Tucker Tigers also managed to avoid defeat in a one-game schedule. Tucker escaped Chamblee in an 11-8 thriller April 5, vaulting to 11-3-1 overall on the season. Senior Chauncey Adams shined on the mound for Southwest DeKalb in an 11-1 victory over Galloway April 5. Adams went five innings, striking out eight and allowing only one hit and one earned run. Seniors Juston Jordan (2-3; 4 RBI; 2 2B; 1 RS) and Ernest Spikes (2-2; 1 RS; 1 RBI; 1 3B; 2 SB) paced a seven-hit offensive attack. Lakeside exploded for 14 hits and 22 runs in a 22-12 triumph over Arabia Mountain April 4. Sophomore Joseph Garcia took center stage, going 3-4; with three RBI and two runs scored at the plate and also earning the mound decision while allowing three runs and three hits to go with three strikeouts over two and two third innings. Junior Levi Cloud (3-4; 3 RS; 3 RBI; 1 2B), sophomore Zaylan Washington (3-3; 6 RBI; 3 RS; 2 HR), freshman Malachi Cloud (2-4; 3 RBI; 1 3B; 1 2B; 1 RS) and junior Deatric Alexander (2-3; 3 RBI; 2 RS; 1 3B) also reached double figures in hits in the contest. Lakeside came back the next day to score 13 runs in a 13-3 defeat of Columbia April 5. Levi Cloud (2-2; 3 RBI; 1 3B; 1 RS) and Malachi Cloud (2-2; 3 RS) delivered two hits each and Alexander cracked a home run on the offensive side. Freshman Will Tansill secured the pitching triumph, striking out six and allowing two hits over four scoreless innings. Senior Matthew Welsh (2-4; 2 RBI; 1 RS; 1 2B), junior Leon Schmidt (2-3; 1 RS; 1 RBI; 1 SB), senior Tony Fenner (2-3; 1 RBI) and senior Max Stephens (2-5; 2 RS; 1 RBI; 1 2B) stroked two hits each for Chamblee in an 11-8 loss to Tucker April 5. Senior Micah Sanders went 2-3 at the plate for Arabia Mountain in a 9-0 road defeat at Carrollton April 6.